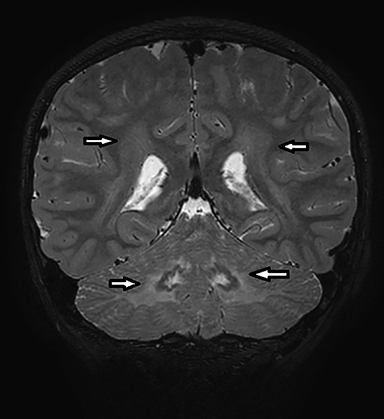 A 9-year-old white male presented with progressive abnormal gait and tightly curled scalp hair. 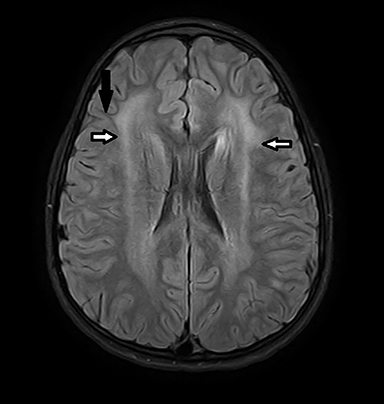 Magnetic resonance imaging revealed a leukodystrophy pattern involving the cerebellar and supratentorial white matter. Coronal T2-weighted image (Figure 1) shows symmetric alternating increased signal in the hila, normal hypointensity of the dentate nuclei and surrounding hyperintensity of the cerebellar white matter. Axial FLAIR image (Figure 2) through the cerebellum accentuates the T2 findings. Axial FLAIR image (Figure 3) through the centrum semiovale shows confluent white matter hyperintensity with sparing of subcortical U fibers. 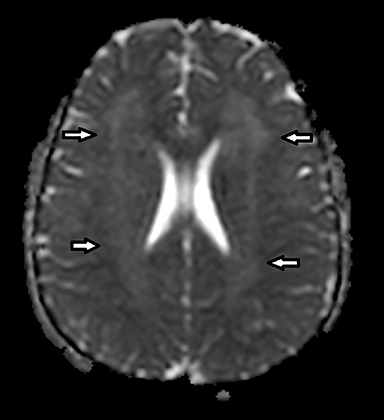 Axial ADC map (Figure 4) shows diffusely increased diffusivity within abnormal white matter. No evidence of restricted diffusion. Imaging findings are that of a nonspecific leukodystrophy with sparing of subcortical U fibers and early cerebellar involvement. The diagnosis of giant axonal neuropathy (GAN) was confirmed by clinical examination and genetic testing. Krabbe disease may mimic GAN with early cerebellar involvement and is more common. 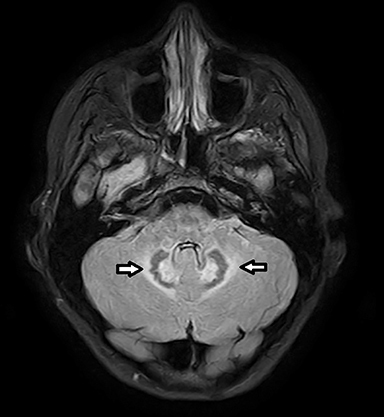 Metachromatic leukodystrophy is more common than both Krabbe and GAN, but does not commonly show cerebellar involvement until late in the disease. Both Krabbe and Metachromatic leukodystrophy spare subcortical U fibers. The diagnosis of GAN is suggested by clinical findings, nerve conduction studies and MRI, and is established by immunodiagnostic testing. Sural nerve biopsy is no longer routinely used.1 Traditional treatment focuses on optimizing intellectual and physical development through a multidisciplinary approach with involvement of neurologists, orthopedic surgeons, psychologists, speech and occupational therapists. Physiotherapy is utilized to preserve mobility as long as possible.1 Gene therapy trials were initiated in February of 2015 and are currently in Phase I trials slated to be completed in July 2018 as of this publication (https://clinicaltrials.gov/ct2/show/NCT02362438). Giant axonal neuropathy is a rare, fatal neurodegenerative disorder that often manifests on imaging as a nonspecific leukodystrophy. However, GAN should be considered among a short list of diagnostic considerations in the setting of early cerebellar involvement and sparing of subcortical U fibers. GAN may mimic Krabbe disease; however, it commonly carries a dramatically different clinical picture. With sural nerve biopsy becoming less common, there is a growing dependence on genetic testing to establish the diagnosis. Kuhlenbaumer G, Timmerman V, Bomont P. Giant axonal neuropathy. Gene Reviews. [internet]. https://www.ncbi.nlm.nih.gov/books/NBK1136/ Published January 9, 2003. Updated October 9, 2014. Accessed November 2016. Israni A, Chakrabarty B, Gulati S, et al. Giant axonal neuropathy: A clinicoradiopathologic diagnosis. Neurology.2014; 82: 816-817. Ravishankar S, Goel G, Rautenstrauss C, Nalini A. Spectrum of magnetic resonance imaging findings in a family with giant axonal neuropathy confirmed by genetic studies. Neurology India. 2009; 57(2): 181-184. Erol I, Alehan F, Alkan O, Bruno C. Involvement of the globus pallidus in giant axonal neuropathy. Pediatric Neurology. 2012; 47(5): 382-384. Alkan A, Sigirci A, Kutlu R, Doganay S, Erdem G. Giant axonal neuropathy: diffusion-weighted imaging features of the brain. J Child Neurol. 2006; 21(10): 912-915. Crete R, Jorgensen SA, Towbin AJ, Towbin R. Giant axonal neuropathy. Appl Radiol. 2018;47(5):40-41. Prepared by Dr. Crete while practicing at Barrow Neurological Institute, St. Joseph’s Hospital and Medical Center, Phoenix, AZ; Dr. Jorgensen and Dr. Richard Towbin while practicing at the Diagnostic and Interventional Radiology Department, Phoenix Children’s Hospital, Phoenix, AZ; and Dr. Alexander J. Towbin, while practicing at the Department of Radiology, Cincinnati Children’s Hospital, Cincinnati, OH.